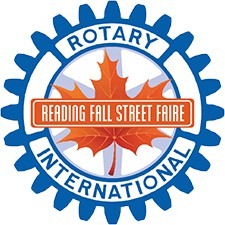 The Rotary Club of Reading continues to attract local businesses to support the Fall Street Faire on Sunday, September 9, from noon to 5 pm. Silver sponsors are Davis, Clark & Latham Insurance Agency, Hallmark Health, Horseshoe Grille, RCTV, Spurr Financial, and Xfinity. “This is more good news for the Rotary Club and the local residents who attend the Street Faire. The sponsors are so important to the success of this event,” said Event Co-Chair Gregg Johnson. Davis, Clark & Latham Insurance has been in Reading since 1964 and incorporated in 1966 under the leadership of Ken Latham, KC’s dad, until 2005 when KC Latham took over the reins as president. A major provider of personal lines, as well as small start-up commercial insurance, Davis, Clark & Latham takes pride in remaining an independent agency with the flexibility to change insurance companies when they feel underwriting requirements or claims practices are not in policyholders’ best interests. They are located at One Pleasant Street. KC is a Reading Rotarian and Davis, Clark & Latham is sponsoring the dunk tank at the Street Faire. Hallmark Health is a coordinated system of hospitals, physician practices and community-based services providing care for communities throughout north suburban Boston. Since its inception in 1997, Hallmark Health has been committed to its mission of providing quality care for its communities and achieving clinical excellence for the patients it serves. The system includes Melrose-Wakefield Hospital, Lawrence Memorial Hospital of Medford; Hallmark Health Medical Center, Reading; Hallmark Health Medical Associates; Hallmark Health VNA and Hospice; and Lawrence Memorial/Regis College School of Nursing. Hallmark has been a loyal sponsor of the Street Faire for the past five years and a participant since 2009. Hallmark Health Medical Center in Reading is located at 30 New Crossing Road. “We are proud to be a sponsor of the Reading Fall Street Faire once again,” said Alan Macdonald, president, and CEO of Hallmark Health. “As active members in the Reading community, we always enjoy participating in this important and festive occasion. Hallmark Health is a founding member of Wellforce, along with Tufts Medical Center and Circle Health. For more information, visit www.hallmarkhealth.org. The Horseshoe Grille’s proud tradition spans four generations of family ownership. Started as a small, members-only social club in the 1920s, the Horseshoe Club stood at the same location as the Horseshoe Grille does today. The Club opened its doors to the public in 1957, added live music and dancing and was re-named The Horseshoe Lounge. The business gained a loyal clientele and remained much the same until Pat Lee Jr. took over the business in 1985. After studying the seasoned Pitmasters of the South while living in Houston and Kansas City, Lee brought a knowledge and passion for slow-smoked southern barbecue and transformed the old bar and lounge into an award-winning barbecue restaurant. In 2004, Lee realized it was time to take his popular rib joint to the next level. After months of careful planning, the new and improved Horseshoe Grille opened its doors to rave reviews from customers and critics alike. Centered around a stone hearth and fireplace, the dining room is a cozy family atmosphere. The Boston Globe has recognized the Horseshoe’s contemporary American faire and classic barbecue favorites as some of the best in Metro Boston. “We love participating in the Fall Street Faire, it allows us to reconnect with our loyal guests and to make new friends. We enjoy working with you to solidify the years of partnership between Reading and North Reading and our similar business communities,” said Lee. Reading Community TV (RCTV) is Reading’s non-profit community television station. The state-of-the-art media center opened in the winter of 2010, providing more resources, including four cameras, fully lighted digital video studio with chroma key. The studio can be used for film, photo, video and audio productions and can be operated by a six-member crew or open person. They have the ability to record or go live. These resources are available to the public. RCTV offers a multi-purpose room that can be used to host member events, guest speakers, performances, film festivals and screen RCTV programming. They can also host your cocktail party, potluck dinner, corporate event, movie night, sporting event or trivia night. Seen around town for many years, Executive Director Phil Rushworth and his crew film local government meetings and attract young students with classes from beginning media production, music video, TV acting and behind the scenes goings on. “RCTV is happy to support a great community event like the Reading Fall Street Faire and we will once again provide live coverage,” said Rushworth. RCTV will sponsor the Pie-Eating Contest. Kathi Spurr and her dad Newt Spurr bring over 50 years of investment experience to Spurr Financial Investments. Spurr Financial helps align personal goals with financial decisions. The family has been a part of the Reading community for 100 years. Both are dedicated Reading Rotarians and board members and also served as past presidents and treasurers of the Reading-North Reading Chamber of Commerce, Newt being a founding father. “We strive to see that clients are protected and prepared. We want our effort to mean maintaining lifestyles for years to come, said Kathi. Xfinity is part of the Comcast Corporation, a global media, and technology company. Comcast’s Xfinity brand is one of the largest video, high-speed Internet and phone providers to residential and business customers. It also provides wireless, security and automation services to residential customers. Comcast Greater Boston Region serves 1.9 million customers in Eastern Massachusetts, Cape Cod, the Islands, New Hampshire, and Maine and employs 4,000 people. NBCUniversal under the Comcast Corporation operates news, entertainment, and sports cable networks, the NBC and Telemundo broadcast networks, television production operations, television station groups, Universal Pictures, and Universal Parks and Resorts. Visit www.comcastcorporation.com for more information. 5K road race open to children and adults under the direction of Lori Haverty of Tread on the Mill will take place at 8 am before the Faire activities. Those interested in sponsorship, volunteering or running in the 5K race can register at fallstreetfaire.com. Vendor registration closed on August 21, but there may still be spots available, subject to a late fee.